"In collaboration with Santiago de Cuba artist Luis el Estudiante, [photographer Laurence Salzmann] has created a book which reminds us that no one is an island, that we are all parts of a whole. 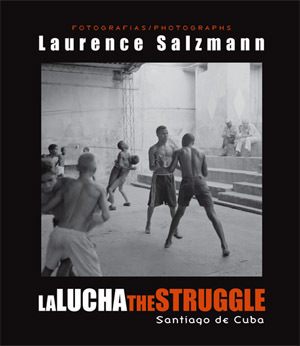 La Lucha/The Struggle confirms that the human endeavor to create transcends senseless political decisions." In Spanish, "luchar" means both to wrestle and to struggle. In his photo series La Lucha/The Struggle, Laurence Salzmann uses this ambiguity as a departure point to explore the relationship between athletic endeavor and national and personal survival. The focus of these photographs is the human form against the backdrop of a minimally equipped training studio. The images of the wrestlers in La Lucha represent an appreciation of the masculine form as well as an exploration of the role of sports in national identity.